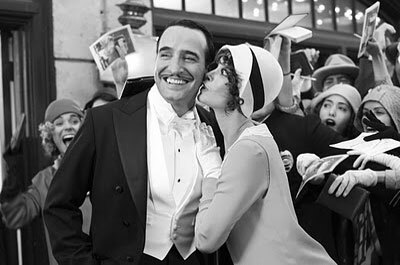 I heard that the winner of the Best Picture award for the 2012 Oscars, The Artist, was conceived as a love letter from director Michel Hazanavicius to his wife and leading lady, Berenice Bejo. That fact alone is so romantic, it made me sigh wistfully before I even saw the film. After seeing it, all I could think was: what a lucky gal she is! The Artist is a tribute not only to the lovely Bejo, but to the black and white format, to the Golden Age of Hollywood, to silent movies, and to great directors like Orson Welles, Billy Wilder and Alfred Hitchcock. When a director is able to take all the aspects of great film-making and put them together to create something truly original - that is when a cinematic miracle takes place. Film buffs were impressed by how this low-tech wonder managed to accomplish all the things one expects from a great film: an interesting plot, inspired acting, beautiful lighting, compelling camera work and a fantastic sound-track, all without the special effects or hyper-editing that go into most films today. God forbid, it wasn't even in 3-D! The Artist appealed to me too, for the above reasons, as well as for the fact that it is just so darn charming. Far from being an artsy foreign film, though it features two major French stars, Jean Dujardin, who plays silent movie heart-throb George Valentin, and Bejo, who plays America's sweetheart Peppy Miller, the film is filled with familiar British and American faces such as John Goodman, Penelope Ann Miller, Malcolm McDowell and James Cromwell, which I think makes it particularly accessible to the mainstream movie-goer. Not everyone I talked to liked The Artist. I have friends who were more or less unimpressed, citing the fact that it takes no great effort to make a silent movie in this day and age. And though they thought the story was cute, they didn't feel it was cute enough to warrant a Best Picture award. But for me, when a director is able to take all the aspects of great film-making and put them together to create something truly original - that is when a cinematic miracle takes place. I'll admit there were many good films nominated this year. I would have loved to have seen Woody Allen receive his due, for once, for Best Director, though he did pull out a Best Screenplay award The Help was a triumphant success, Hugo...magnificent, and The Descendents, well, just two words are needed to describe its magic: George Clooney. But it really was The Artist that combined everything required, in my book, to earn the Best Picture title. The icing on the cake? It was, indeed romantic. So, if you don't see The Artist for any grand artistic reason, at least see it for the romance. I promise, by the end, you'll be sighing too.